It’s been a long time since I attempted making a video. But, I’ve been inspired by the Plan with Me videos (see links at end of post) that I love to watch on YouTube to make my own. When I was taping it, I wasn’t sure if I’d be able to edit it into anything worth sharing. I actually recorded some footage of Zumba Convention back in 2013 that I never did anything with. I did the same with a trip my sister and I took to Asheville back in March, which I finally finished this weekend. Only three months late. No biggee. But, I also finished editing another video this weekend, and it’s titled Plan with Me: Hyperbole and a Half Theme. This was my first time doing a custom theme, and it was inspired by a visit from my friend, Megan. I had planned to do something special with the events we had planned for her visit. But, when she casually mentioned, “I can’t wait to see how you decorate your planner for the week I visit,” I knew I needed to get more creative. At first, I thought about picking out some cute washi tape (tiny ice cream cones!) and other decorations that I thought she’d like. But, then I remembered this tutorial by Belinda Selene for DIY stickers and decided to take this week’s layout to the next level. It didn’t take me long to decide on the Hyperbole and a Half theme, because Megan and I are huge fans. Plus, the graphics are amazing, and I knew they’d look great in my planner. Here’s the finished result. Check out the video for a walkthrough of my planner decorations. 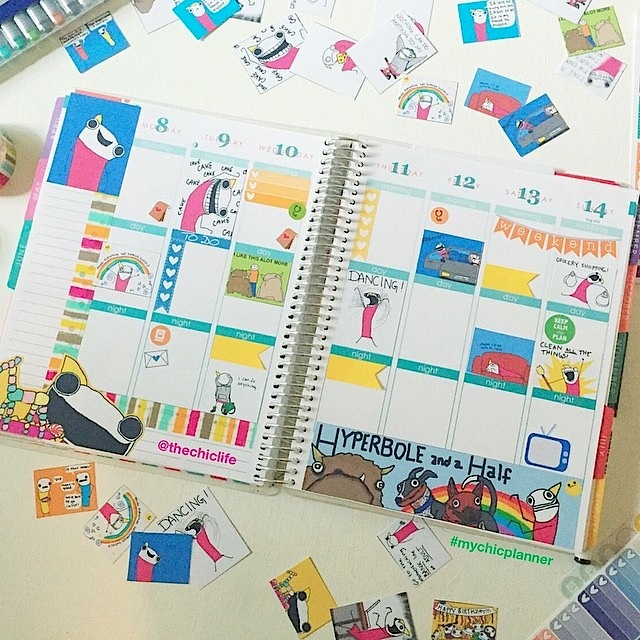 *Note: Erin Condren recently released a horizontal weekly layout. The dimensions in this post are for the original/vertical theme. If you’d like to save $10 on your Erin Condren, you can use my referral link by clicking here. I’ll earn a little credit, and you get a discount, so it’s win-win. This is not an affiliate link. The EC referral program is open to everyone. What’s Next for TCL Videos? I started a notebook with more video ideas. I have one ready for upload and another filmed. But, have you ever made a video before? My goodness, they take a lot of work! Props to all you YouTubers out there. Anywho, I’m hoping to upload a new video every week to every other week, on Sundays. So, hopefully you guys enjoy seeing The Chic Life content now in video form! And for my more-food-oriented friends, I’ve been brainstorming ways to incorporate the food blog aspect of The Chic Life into some upcoming videos. So far, all my video ideas are more focused on planner-related topics, but I’m hoping to work some food into the mix, too.